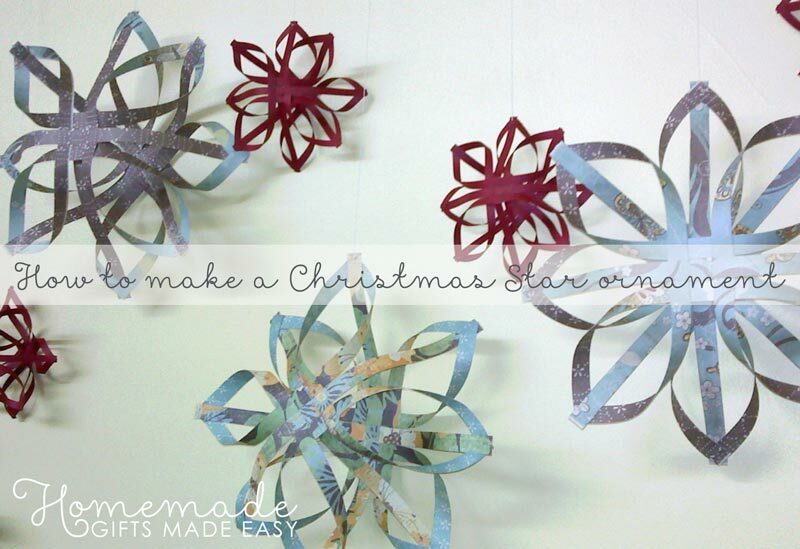 Learn how to make a star out of paper strips to create a beautiful ornament for your Christmas tree! 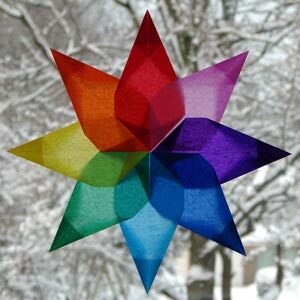 These star Christmas ornaments will look lovely hung on your Xmas tree or in your window! 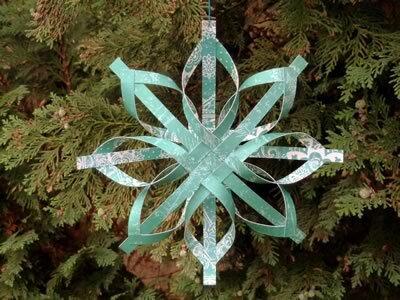 The thing I love about these Christmas tree stars is that they look so woven and intricate, and yet the method for how to make a star like this is incredibly easy. 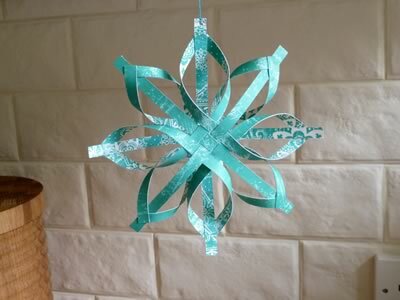 In fact they're so easy that in Finland these are a popular decoration for children to make! 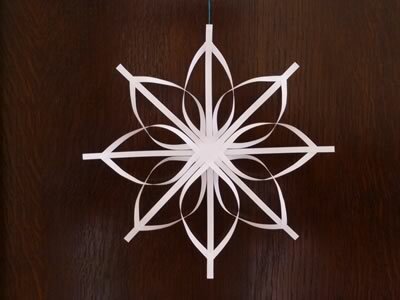 Because of the intricate design, I think these star decorations look a little bit like snow-flakes, don't you? 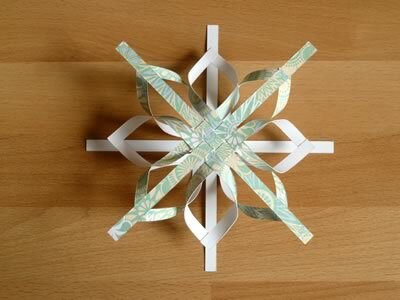 If you wondering how to make paper snowflakes then these could be an option, although they have 8 points instead of 6. 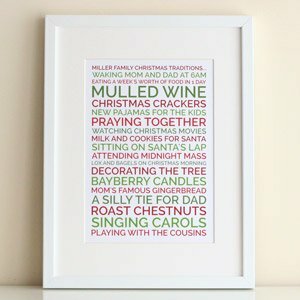 This project is adapted from the book Home-Made Christmas by Tessa Evelegh, which incidentally has lots of other fun Christmas crafts too. On amazon the book got only 1 review and it's a bad one, but I borrowed the book from the library and I actually love like it and found some brilliant ideas. That's it! 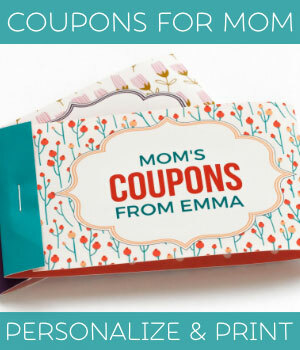 This project is a good way to use up offcuts of wrapping paper or scrapbooking card stock. 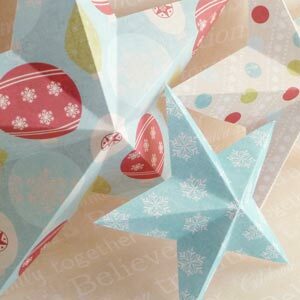 I generally prefer making these stars out of card stock rather than paper, because the stiffness makes it a little easier to work with. 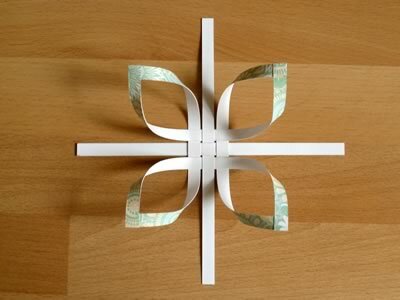 Cut 12 strips of paper or card, each about 6" by ¼" (15 cm by 0.7 cm). 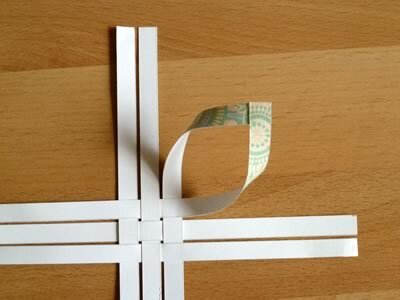 Using strips this size will make a star about 5 ½" wide. 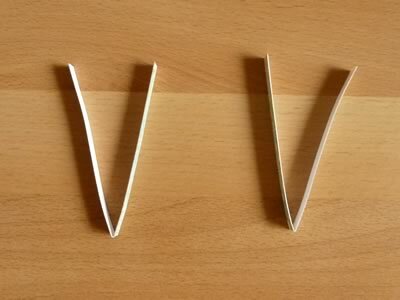 Of course you can scale the size up or down if you like! 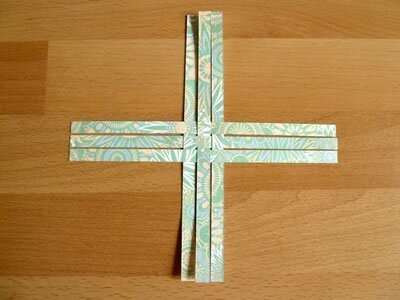 Take two of the strips and fold them in half. 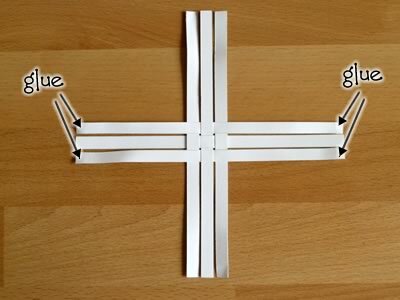 This is so that you'll be able to see where the center of each strip is for the next step. 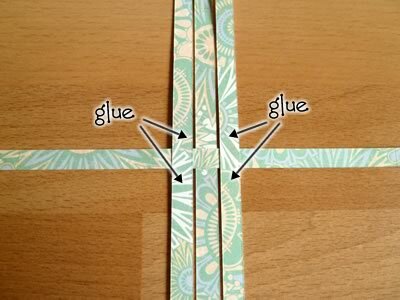 Take one of the two strips you folded and place it vertically on the table, then glue a small patch at the center of the strip with your glue stick. 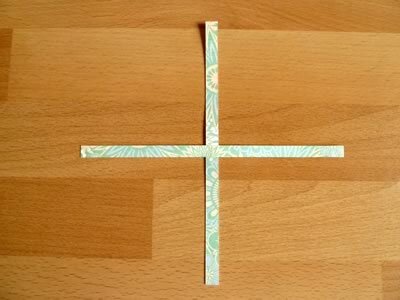 If your paper has a colored side and a blank side, then make sure you put it colored-side up. 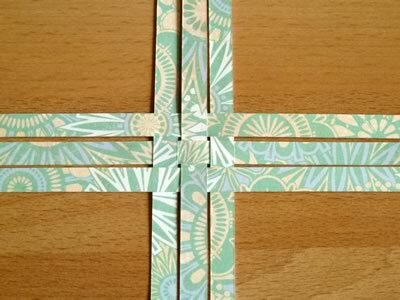 Lay the other strip across the first strip at right angles so that the two get glued together. 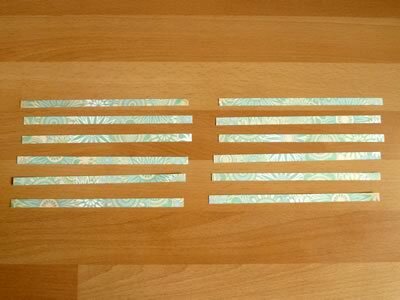 Place two more strips vertically next on either side of the first strip onto the patches you just glued. 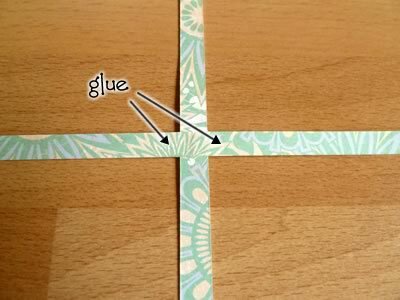 Place two more strips horizontally, so that they weave over and under the strips that are already there. 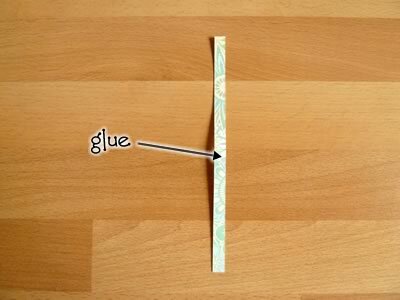 They will get glued down with the patches of you just glued. 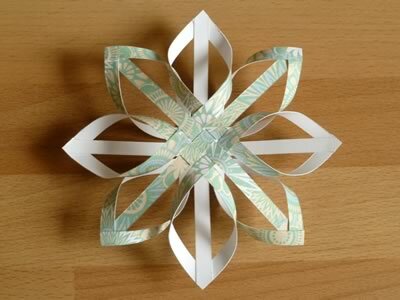 Place one half star on top of the other, offset by 45° so that the "petals" of one half line up with the strips of the other half. 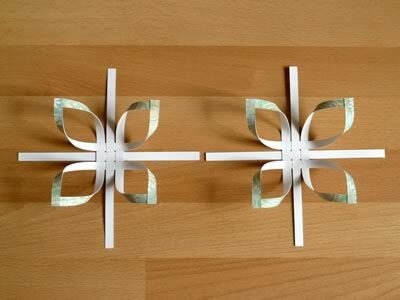 Also, the petals of the two halves should face inward so that the two halves "hug" each other. 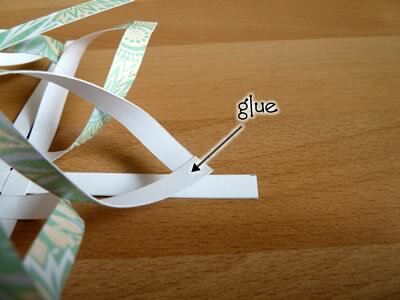 Feed the strip through the loop of the petal, and glue it to the petal, as shown below. 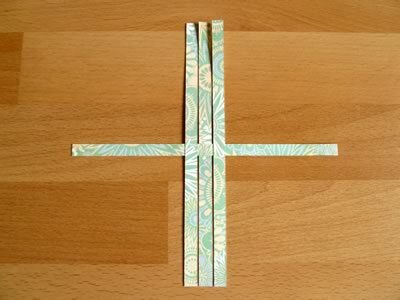 The strip should extend roughly ¼" (between 0.5 and 1 cm) beyond the petal, depending on how long your strips are. 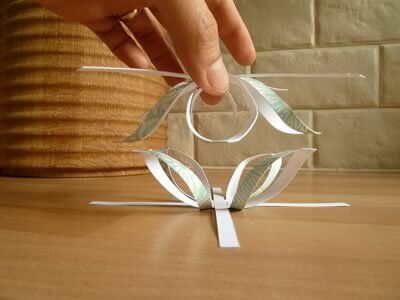 Basically when you put the halves together you'll see that the strips naturally extend a bit beyond the petals, and you just want to glue them in the position they are naturally in. Here's a side view of the star once all the strips and petals are glued together. As you can see it has a nice kind of 3D look. 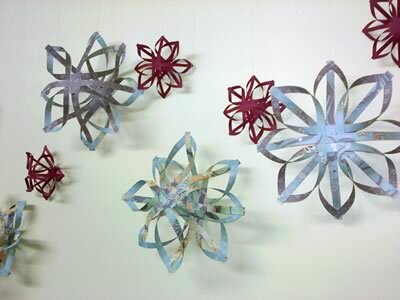 Here are some stars that reader Heike made to brighten up her office wall- thanks for sending in your photo Heike! 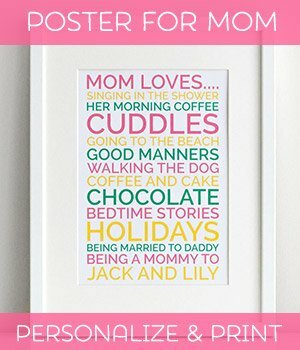 I think the colors are beautiful. 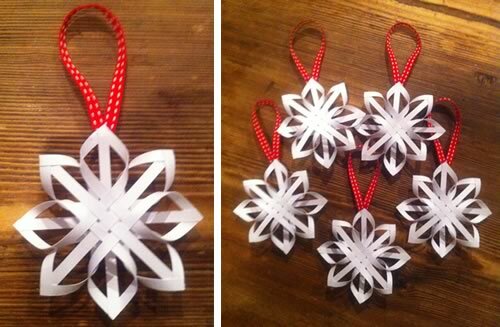 And here are some stars that reader Clare made as Xmas decorations - thanks for sending in your photos Clare! 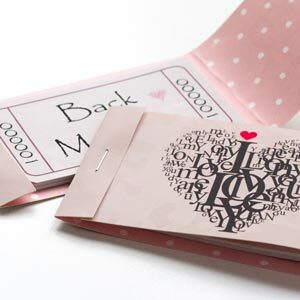 Nice idea to use ribbon for hanging too. 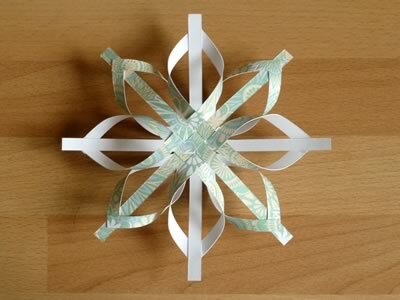 You can make a beautiful, delicate-looking star by using longer, thinner strips of card or paper. 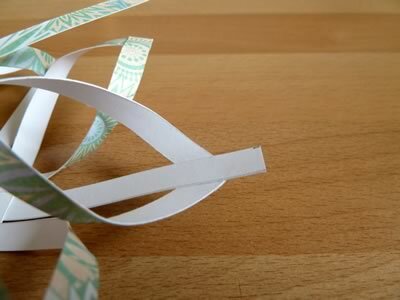 Here's one I made with 8" by &frac15;" strips of office printer paper. 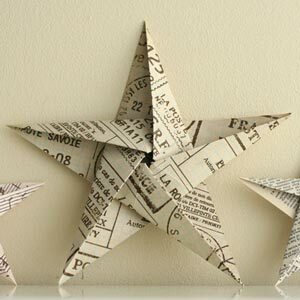 If you make a delicate star like this, then it helps if you actually glue the two star-halves together at their centers (i.e. 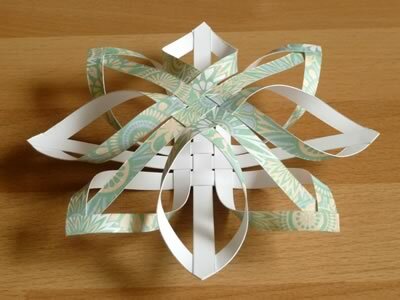 the woven sections), to give the star a bit more support and structure. 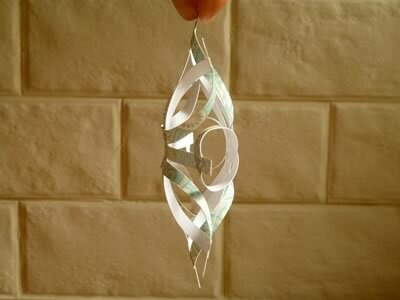 ... or take a look at my full collection of DIY Christmas ornaments .